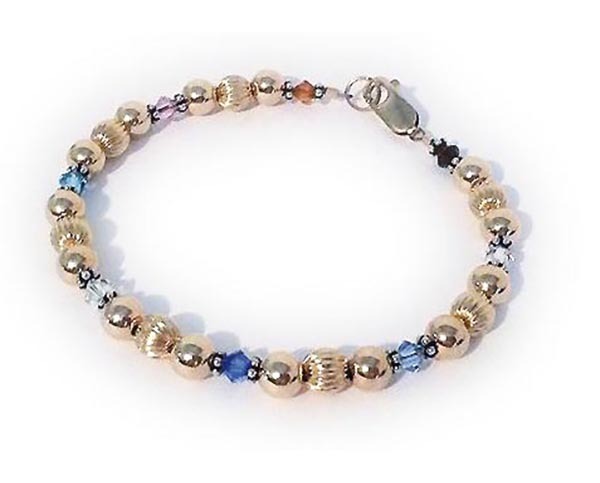 Gold/Gold Birthstone Bracelet for mommy or grandma! I used 14k gold-filled, .925 sterling silver and flower spacer beads on this gold on gold birthstone bracelet. To order a bracelet like this one put "Nov Jun Mar Apr Sep Mar Apr Jan" in the blank below. Space is limited to please abbreviate the birth months. Details: Alternating corrugated 14k - 6mm 14k gold-filled corrugated beads with 5mm 14k gold-filled smooth round beads with 3mm sterling silver flower bead spacers.